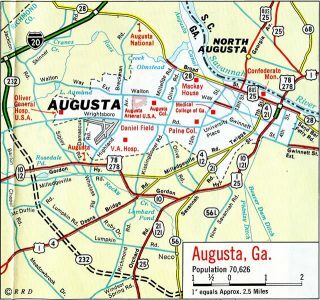 Known as the Bobby Jones Expressway in Georgia and Palmetto Parkway in South Carolina, Interstate 520 encircles Augusta and North Augusta along a 23-mile loop. The freeway starts out with eight overall lanes and a concrete barrier median running south from I-20 and Georgia 232 to Wrightboro Road (Exit 2). This stretch includes a set of two-lane collector distributor roadways as it serves a bevy of retail areas and Augusta Mall. The freeway carries six lanes south to the 2012-reconfigured interchange with U.S. 78 & 278 (Gordon Highway), which provides one of two routes (U.S. 1 being the other) connecting I-520 with Fort Gordon to the west. The interchange with U.S. 1 was also adjusted to remove loop ramps from I-520 to Deans Bridge Road. Beyond there, I-520 curves easterly to U.S. 25 and Georgia 56 on the south side of Augusta. The remainder of I-520 through Richmond County takes the loop northeast across Phinizy Swamp to industrial areas along the Savannah River and East Augusta. The freeway ended there until 2004, when the first leg of the Palmetto Parkway opened northward to Aiken County, South Carolina. Palmetto Parkway bisects suburban areas of North Augusta, but retains a rural four-lane feel to Interstate 20 by Mathis Lake. The first Interstate 520 shield posted after the Savannah River bridge. Opened on June 22, 2004, the initial leg of Palmetto Parkway connected Georgia 28 and Sand Bar Ferry Road with U.S. 1-78-278. Photo taken by Carter Buchanan (08/08/04). The designation of Interstate 520 was approved by AASHTO on October 28, 1977 for the Bobby Jones Expressway from Interstate 20 southward to New Savannah Road. Previously numbered as Georgia 232, the expressway ran south from I-20 to U.S. 1 (Dean Bridge Road) by 1975. I-520 appeared the Official Georgia Highway Map first in 1980, when Bobby Jones Expressway was completed east to Georgia 56 Spur. Bobby Jones Expressway initially opened as a spur south from Interstate 20 to Wrightsboro Road. This segment was completed by 1967 per the Official Georgia Highway Map. Interstate 20 opened in conjunction with the Georgia 232 freeway west to Georgia 383 (Exit 194) and east to Georgia 28 (Exit 199) in 1967. Construction in 1972 was underway to extend Bobby Jones Expressway southward to U.S. 1 (Deans Bridge Road). This stretch opened by 1975. Georgia 28 leading east from Interstate 20 was eventually upgraded to the John C. Calhoun Expressway. Work broke ground on the controlled access route in February 1974 at Greene Street and Milledge Road. The road was built in two phases. The western section opened first eastward to a temporary end at 15th Street. 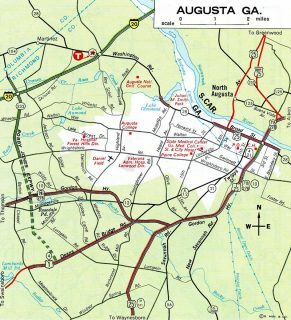 Completion of phase two in the early 1980s took the expressway along an elevated roadway over Augusta Canal to Greene Street ahead of Downtown Augusta. Traffic separates into single lane ramps for I-20 west back to Augusta and I-20 east for the rural drive to Lexington and Columbia. Photo taken 06/24/10. See Interstate 520 East on AARoads for more photos from this perspective. Exit 6 to I-520 (Palmetto Parkway) west departs from within the elongated diamond interchange (Exit 5) with U.S. 25 & S.C. 121 (Edgefield Road). I-20 leaves the North Augusta area for a five mile exit less stretch beyond Interstate 520. Photo taken 04/13/12. See Interstate 20 East – North Augusta to Lexington on AARoads for additional photos from this perspective. Two miles ahead of the directional T interchange (Exit 6) with Interstate 520 on I-20 west by Hightower Creek. Photo taken 04/16/12. Back to back ramps depart in one mile for Interstate 520 west to North Augusta and U.S. 25 & S.C. 121 to Edgefield. Photo taken 12/31/12. A third westbound lane opens ahead of the off-ramp (Exit 6) for Interstate 520 west as I-20 passes by the Laurel Lakes Estates subdivision. I-520 south to U.S. 1-78-278 provides a direct route to Downtown Augusta, Georgia. Photo taken 12/31/12. Interstate 520 leads south from Interstate 20 via Exit 6. Three interchanges serve North Augusta before the freeway crosses the Savannah River to East Augusta. Photo taken 04/16/12. Approaching the 1998-2004 eastern terminus of Interstate 520 at Laney Walker Road near the Savannah River during construction of phase 1 of the Palmetto Parkway. Photo taken by Chris Patriarca (04/08/03). Exit 16 is the last interchange of the Bobby Jones Expressway portion of Interstate 520. A half diamond interchange connected the freeway with Laney Walker Road, with service roads linking the ramps to adjacent San Bar Ferry Road. This is now a split diamond interchange. Photo taken by Chris Patriarca (04/08/03). Traffic departed Interstate 520 to Laney-Walker Road and Georgia 28 (Sand Bar Ferry Road). GA 28 leads 2.5 miles northward to Downtown Augusta. Photo taken by Chris Patriarca (04/08/03). Barricades lined the stub ends of the Interstate 520 roadways at Exit 16. 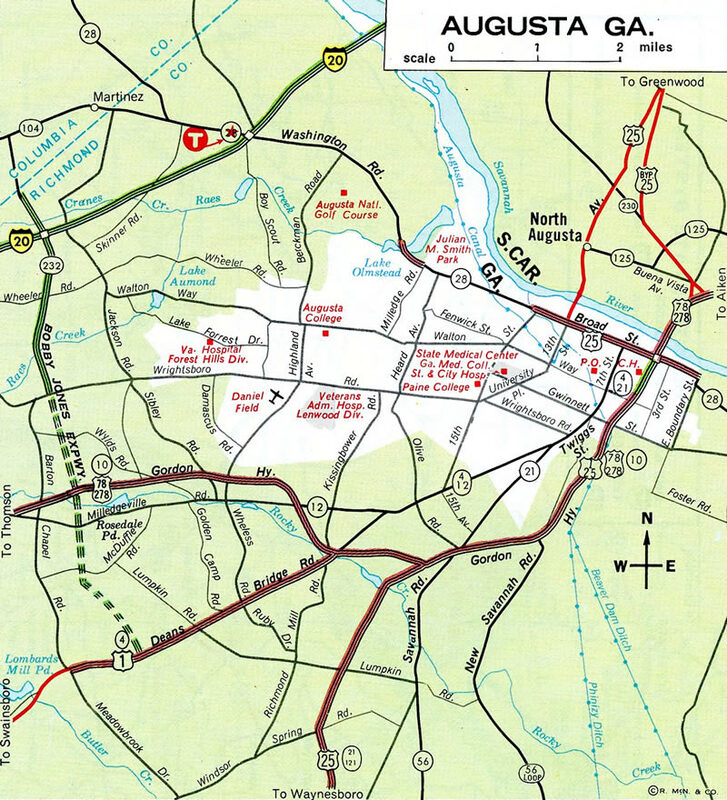 Berms were prebuilt in 1998 for the eventual northward extension into Aiken Count, South Carolina. Photo taken by Chris Patriarca (04/08/03). Leading west from Laney-Walker Road and the then-westbound beginning of Interstate 520. There are no exits for the next six miles as the Bobby Jones Expressway crosses industrial areas and adjacent wetlands. Photo taken by Chris Patriarca (04/08/03). Interstate 520 west / Bobby Jones Expressway shield on Laney Walker Boulevard westbound. Photo taken by Chris Patriarca (04/08/03). A westbound service road links Georgia 28 (Sand Bar Ferry Road) with Laney Walker Boulevard and the on-ramp to Interstate 520. A set of overpasses span Laney Walker Boulevard here now. Photo taken by Chris Patriarca (04/08/03). Approaching the signalized intersections at what is now a split diamond interchange joining Interstate 520 with both Laney Walker Boulevard and Georgia 28 (Sand Bar Ferry Road). Photo taken by Chris Patriarca (04/08/03). Looking east at construction for the Interstate 520 extension over the Savannah River from Georgia 28 (Sand Bar Ferry Road). Photo taken by Chris Patriarca (04/08/03). Following the westbound service road westbound from Georgia 28 to Laney Walker Boulevard and the on-ramp to Interstate 52. 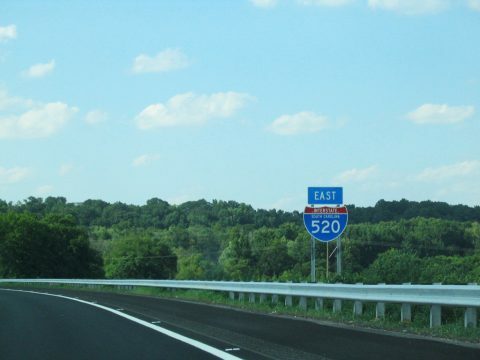 The span wire supported I-520 sign above displayed U.S. 520 erroneously in 2001. Photo taken by Chris Patriarca (04/08/03). The lone interchange along phase 1 of the Palmetto Parkway was the junction with U.S. 1 (and U.S. 78-278, which is not signed). Photo taken by Carter Buchanan (08/08/04). Descending from the freeway along the off-ramp to U.S. 1-78-278. A left turn leads to North Augusta, while a right turn leads to Aiken. Again U.S. 78 and 278 are not acknowledged. Photo taken by Carter Buchanan (08/08/04). Although under construction at the time this photo was taken, this guide sign advised motorists on northbound U.S. 1 and eastbound U.S. 78-278 to prepare to turn right onto westbound Interstate 520 (Palmetto Parkway) en route to Augusta, Georgia. Photo taken by Carter Buchanan (08/08/04). A trailblazer directed motorists onto the westbound beginning of I-520 from U.S. 1 north & 78-278 east. Photo taken by Carter Buchanan (08/08/04). The parclo interchange with Interstate 520 was partially opened until 2009, when I-520 was extended northward to S.C. 125, U.S. 25 and I-20. Photo taken by Carter Buchanan (08/08/04). This is the first reassurance shield on westbound Interstate 520 after the interchange with U.S. 1-78-278. Photo taken by Carter Buchanan (08/08/04). Traveling north from Wrightsboro Road (Exit 2), Interstate 520 enters the final two miles. Photo taken 12/31/12. Expansion of Interstate 520 leading west to I-20 expanded Exit 1C to two lanes and replaced the loop ramp (Exit 1A) to I-20 west with a high speed flyover. Photo taken 12/31/12. A collector distributor roadway separates movements from the adjacent Wheeler Road on-ramp from the Bobby Jones Expressway mainline leading north to Georgia 232 and Gonzalez. All traffic bound for I-20 departs for the c/d roadway via two-lane slip ramp. Photo taken 12/31/12. Interstate 520 ends as Georgia 232 begins. The state route extends the expressway north to a commercial arterial to Georgia 104 at Martinez. There GA 232 turns west along side GA 104 parallel to the I-20 corridor to U.S. 221. Photo taken 12/31/12. For additional photos from Interstate 520 west, see Interstate 520 West on AARoads. The last mainline interchange is Exit 1C for Wheeler Road. This commercial arterial also sees an interchange with Interstate 20 at Exit 195 to the west. Photo taken by Chris Patriarca (04/08/03). Entering the original folded diamond interchange (Exit 1C) with Wheeler Road prior to the upgrade of I-520 to I-20. This exit was not an original interchange along the Bobby Jones Expressway. Photo taken by Chris Patriarca (04/08/03). The on-ramp from Wheeler Road originally formed an auxiliary lane to Exit 1B for Intestate 20 east. Reconstruction of Interstate 520 during 2000 included both resurfacing and installation of sound barriers between U.S. 1 (Deans Bridge Road) and I-20. Photo taken 12/15/01. Entering the original full cloverleaf interchange (Exits 1B/A) with Interstate 20 on I-520 west. The east-west freeway will cross the state line in six miles and reach Columbia in 75 miles. Photo taken 12/15/01. An end shield was installed at below the I-20 overpasses at Exit 1A by February 2001. Georgia 232 begins at this interchange and proceeds northward to Georgia 104. The state route was later upgraded to Scott Nixon Memorial Drive. Photo taken by Chris Patriarca (04/08/03). End Interstate 520 and Interstate 20 West button copy overheads. These signs were removed during the 2000 resigning project of Interstate 520 (see above photo). Photo taken 08/05/00. A folded diamond interchange replaced the signalized intersection between Georgia 232 (Bobby Jones Expressway) and Scott Nixon Memorial Drive during the project to upgrade Interstates 20 and 520. Photo taken 12/31/12. A two-lane ramp quickly departs Georgia 232 (Bobby Jones Expressway) south for Interstate 20 west to Thomson, Greensboro and Atlanta. Photo taken 12/31/12. Georgia 232 ends as Interstate 520 east begins prior to the loop ramp (Exit 1B) for I-20 east to North Augusta, Aiken and Columbia, South Carolina. Photo taken 12/31/12. This guide sign was posted south of the former at-grade intersection of Georgia 232 (Bobby Jones Expressway) with Scott Nixon Memorial Drive. It was removed during work to upgrade the I-20/520 exchange. 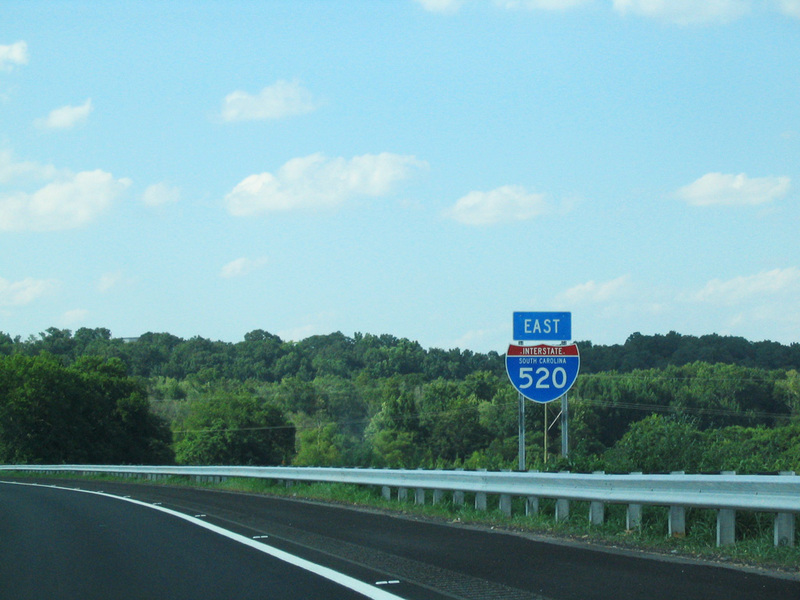 Interstate 20 is formally named the Carl Sanders Highway between Atlanta and the South Carolina state line. Photo taken 04/21/01. Southbound Georgia 232 reached Exit 1A for Interstate 20 west. Interstate 520 quickly widened to six lanes as it led south to Wheeler Road. Photo taken by Chris Patriarca (04/08/03). An end GA 232 / begin I-520 shield assembly stood at the loop ramp (Exit 1B) for I-20 east to Columbia, South Carolina. Photo taken by Chris Patriarca (04/08/03). Interstate 20 enters Augusta-Richmond County and expands to an eight lane freeway to Exits 196A/B with Interstate 520 east and Georgia 232 north. Photo taken 04/13/12. Lowering toward the directional cloverleaf interchange (Exits 196A/B) with Bobby Jones Expressway on I-20 east. Photo taken 04/13/12. A collector distributor roadway takes drivers to both I-520 east and GA 232 north as the I-20 mainline continues east with three through lanes. Photo taken 04/13/12. For additional photos see Interstate 20 East – Madison to Augusta on AARoads. The first indication of Interstate 520/Exit 196A/B on Interstate 20 was posted at the Wheeler Road overpass, 1.25 miles to the west. Photo taken by Chris Patriarca (07/06/03). The Wheeler Road eastbound on-ramp formed an auxiliary lane to Interstate 520 east (Exit 196A). I-20 now carries four eastbound lanes on this stretch. Pine forest pictured here gave way to development on both sides of the freeway. Photo taken by Chris Patriarca (07/06/03). Eastbound Interstate 20 reached Exit 196A for Intestate 520 east. Control cities for the Bobby Jones Expressway were omitted in favor of freeway name. 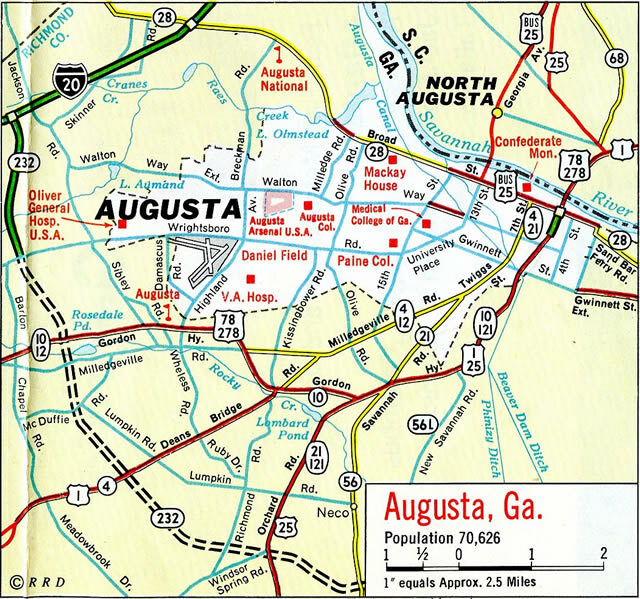 There are seven mainline interchanges along I-520 in the city of Augusta. Photo taken by Carter Buchanan (08/08/04). Advancing west from Georgia 28 (Washington Road), Interstate 20 expands to a six lane freeway to Bobby Jones Expressway (I-520 west / GA 232 north). Photo taken 12/31/12. A two lane off-ramp serves ramps for Walton Way Extension, GA 232 north to Martinez and I-520 east toward Fort Gordon in one mile. Photo taken 12/31/12. Two lanes continue through the exchange with Bobby Jones Expressway along Interstate 20. Motorists joining I-520 southward follow a c/d roadway to the commercialized exit with Wheeler Road (Exit 1C). Photo taken 12/31/12. Exits 196B/A leave I-20 west. An unnumbered half diamond interchange lies just ahead with Walton Way Extension, an arterial route running along the east side of the retail area along both Georgia 232 and the Wheeler Road exit from I-520. Photo taken 12/31/12. Two miles east of Interstate 520 and Georgia 232 on I-20 west. The freeway is now six lanes wide along this stretch with a concrete barrier median and sound walls. Photo taken by Chris Patriarca (07/06/03). Former overhead posted one mile east of the cloverleaf interchange (Exits 196B/A) with I-520 east and GA 232 north on I-20 west. Photo taken by Chris Patriarca (07/06/03). Pleasant Home Road, which passed I-20 above the Exit 196B off-ramp here, was replaced by Walton Way Extension as part of the interchange rebuild with Interstate 520. Photos taken by Chris Patriarca (07/06/03). This loop ramp (Exit 196A) for I-520 east was replaced with a flyover ramp opened in July 2009. Photo taken by Chris Patriarca (07/06/03). "Expressway Set – For Construction." Augusta Chronicle, The (GA), November 1, 1997. "Drivers Will See New Signs – Changed Exit Numbers Will Be Based On Mile Based Markers Instead of Previous Sequential System." Augusta Chronicle, The (GA), January 11, 2000. "Road Ready – Bobby Jones Extension To Open Last Stretch Of Expressway In County Can Be Traveled Friday, Could Bring More Development." Augusta Chronicle, The (GA), July 29, 1998. "Officials Dig In To Road Plan." Augusta Chronicle, The (GA), November 13, 2002. "Parkway Now Open For Business." Augusta Chronicle, The (GA), June 23, 2004. "State Funds Speed Plans." Augusta Chronicle, The (GA), March 25, 2005. "Palmetto Parkway set to be complete by 2009." Augusta Chronicle, The (GA), May 27, 2007. "Added projects to delay process." Augusta Chronicle, The (GA), January 23, 2008. "Parkway eases traffic." Augusta Chronicle, The (GA), December 23, 2009. "Crews aim to finish work – Heavy rain caused delays in road projects." Augusta Chronicle, The (GA), October 31, 2009. "I-20 moment briefly stops traffic – Flyover ramp is site for ribbon-cutting." Augusta Chronicle, The (GA), November 13, 2009. "Bobby Jones Construction Nearing End." Augusta Chronicle, The (GA), December 27, 2014. Page updated November 12, 2015.